The nearly completed Tillotson’s Factory at Scarne, Launceston in 1968. Many will remember Tillotson’s who through a series of takeovers now operate as David S. Smith. The company arrived in the town to much fan fair in 1968. It was a major coup for the Town Council in attracting the company to Launceston, as it has to provided continuous employment for nearly 50 years. The company owes its origins to John Tillotson who in 1820 began working as an apprentice for a small printing works, Robert Marsden Holden, who had premises in Mealhouse Lane, Bolton, Lancashire. John Tillotson eventually married his boss’s daughter and took over the business in 1850 changing the name of the business to his own.. At that time , the firm was doing letterpress printing, stationary, ledgers, account books and like products. His son, William Frederick Tillotson, became apprenticed to his father. He managed to persuade his father to help him launch the first Bolton Evening News which stretched to four pages and was one of the first evening papers to be produced in the provinces.. William Frederick Tillotson married Mary Lever on 20 April 1870. Severe difficulties dogged WF Tillotson’s early enterprise but he persevered and the Evening News really took off under the first editor William Brimelow. Legend has it that the job application process then could be traumatic. Brimelow is said to have had a habit of throwing a book on the ground just as potential applicants entered the office to see what their reaction was. The Tillotson’s went on to become a notable family in newspaper circles, including a National president of the Newspaper Society. By the 1960’s they produced no fewer that eleven weekly newspapers in Lancashire and Staffordshire. The company began to manufacture cartons and the business began to expand throughout the second half of the 19th Century, and in 1900 the carton making factory was transferred to Liverpool, where it became one of the leading factories in this type of work in the industry. Here Tillotson’s produced printed cartons and display outers, but attention was early being given to the case side of packaging, and in 1910 a solid container factory was started in Manchester. In 1956, it was decided to round off the packaging interests by entering the corrugated case market, and an interest was taken in a small firm in Burwell, Cambridgeshire; in the next ten years, this side of the business rapidly grew and in 1959 Tillotson’s Corrugated Cases Ltd. Became a wholly-owned subsidiary. The case Division was then represented by the solid container factory in Manchester, the corrugated case factory in Burwell and a corrugated case factory in Monmouth which had been completed in 1961 and was concerned mainly with the production of heavyweight and triple wall board. Tillotson’s Ltd were bought by St Regis Paper Company of New York, and Marcus Tillotson, the last of the founding family to be connected with the Company and its Chairman since 1956, retired. David S. Smith, a company started by the Smith brothers in East London in 1940 making hand-made rigid boxes, in turn purchased the St. Regis Paper Company in 1986 for £83 million. 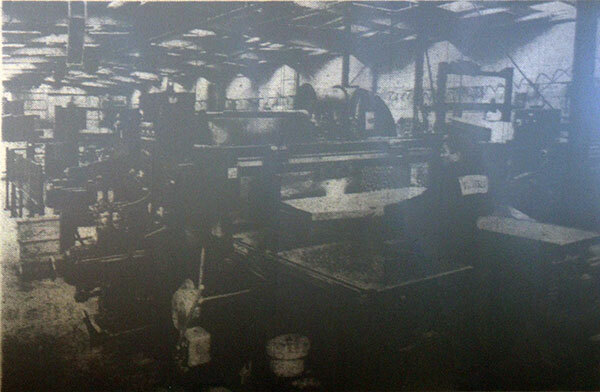 Tillotsons new factory in 1968 with a newly installed print unit.